Today is, if not exactly his birthday, the day the world generally observes as Beethoven’s Birthday. From the historical record, we know he was baptized on December 17th, 1770 – he was more than likely born the day before but there is nothing that tells us that specifically. Since I wrote last Saturday about Elliott Carter celebrating his 102nd birthday with a new work given its world premiere in Toronto, I thought today I’d tell you about a new work that received its world premiere this past summer, a brand new symphony by Ludwig van Beethoven. The only difference is – this is fiction. Well, it might seem obvious, but I just wanted to be sure we’re all on the same foot (bunions aside). This is an excerpt from The Doomsday Symphony, a music appreciation thriller which I began sketching over the summer and started writing in mid-October. 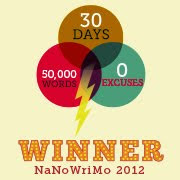 During the month of November, it was my NaNoWriMo project where the goal was to write an additional 50,000 words by the end of the month (piece of cake). Even at 90,000 words, it’s not finished yet and, though friends have asked me about it, it’s also not ready to be posted at Thoughts on a Train. Unlike my earlier attempts -- The Schoenberg Code and The Lost Chord – this one is not a parody of anything written by Dan Brown. While it would be difficult to say it is entirely “original” – now, there’s a philosophical red-herring – despite the occasional parody, let’s just say in The Doomsday Symphony, I’m on my own. First of all, to explain – most of the story takes place on Harmonia-IV, one of a series of parallel universes that is neither exactly Heaven nor Hell where, our hero Dr. T.R. Cranleigh [later changed to T. Richard Kerr] discovers, the population consists mostly of dead musicians or people who once considered themselves musicians, even some music critics (though for these latter it’s probably the equivalent of Hell). The plot involves two villains, each with their independent villainies. In the one that initially draws our hero (a know-it-all musicologist who knows a great deal about very little) to Harmonia-IV, Dr. Klavdia Klangfarben, a trained forensic musicologist, has been hired as an agent by SHMRG’s CEO, N. Ron Steele and his Director of Office Supplies and Classical Music, the would-be composer Manfred (or “Man”) Kaye. They want to “kill off the great composers of the past” in an attempt to corner the market in the music licensing business. Through her thesis advisor, the great Danish musicologist Frøkken Bohr, Klangfarben has discovered that a legendary parallel universe where dead composers go exists and can be accessed through a time-gate located in a field outside the abandoned mining town of New Coalton in Eastern Pennsylvania. Once there, with the help of a lawyer and former musician named Abner Kedaver who counted among his clients Brahms and Mahler, she manages to find the hand-held time-traveling devices the Harmonians use to travel back in time. This way, she can affect the lives of composers like Bach, Wagner, Mozart and Beethoven not by killing them before their prime but by in some way altering their lives so they never achieve the greatness that we revere them for. Without them, other composers would not have been influenced by them because, as we know them, they would never really have existed. What would Brahms be without Beethoven, for instance? And so it affects music in a more long-range way than it might initially seem. In this way, then, by talking a 20-year-old Bach into accepting Dietrich Buxtehude’s job offer to stay in Lübeck as the resident organist – an offer which included marrying his eldest daughter, ten years his senior – Bach might never have gone to Leipzig, would be unlikely to have fathered some twenty children, and would probably have developed into a very fine composer on the level of Buxtehude but probably only one as well known today as Buxtehude – a great composer, perhaps, but not a Great Composer, if you get my drift. The second plot involves a mild-mannered assistant conductor named Rogers Kent-Clarke (who once studied with conductor Louis Lane) who, following Cranleigh, finds himself in the middle of Harmonia-IV, meets Gustav Mahler and hears him telling people about his latest symphony in which (a kind of counterpart to his 2nd Symphony, the Resurrection) he describes the End of the World. With a series of increasingly dissonant chords – similar to the three fateful chords of his 6th Symphony which some call the Tragic – carefully placed structurally throughout the course of this ninety-minute-long work, Mahler is convinced the last chord will bring about the destruction of the universe. A philosopher and apocalyptic cult-leader named Siegfried Schweinwurfer (translated literally from the German as War-Peace Pig-Thrower) therefore dubs it the Doomsday Symphony. Kent-Clarke makes up his mind to steal the score, return to Earth with it and become famous for discovering and premiering a new Mahler symphony – in essence, becoming a SuperConductor. The rather serious side effect of his ambition, unfortunately, could bring about the destruction of the world in 2012, another plot that Cranleigh and his associates - now including Harmonian Detective Milo Smighley and the detective from Pennsylvania who got involved in investigating something completely different at the beginning of the story, Jenna Sainte-Croix - must solve before the novel's end. Hence, the title of the novel – since I thought Bach to the Future wasn’t quite as effective. Anyway, at this point, early in our story, the Universal Philharmonic – under the direction of a conductor whose name I have not yet chosen – is preparing the premiere of Beethoven’s latest symphony, his 39th. This is the opening sequence from (quite coincidentally) Chapter #39, at the first rehearsal held in Einstein Hall. The music was so calm, so self-assured and, above all, so beautiful. From the expansive opening, magisterial yet thoroughly human, there was no doubt on any of their faces this would be Beethoven at his best. Here was a new masterpiece and this orchestra was the first to bring it to life. Every one of them sensed the honor. They followed [Maestro] implicitly, watching the years melt away from him. The crotchety old man, frail yet still in his prime, became the music – likewise calm, self-assured and even, in a way, beautiful. They knew that Beethoven had been working for over a decade on this symphony, starting the sketches even before he had begun the last one. That one had disappointed many, though the composer held his ground. "What is it with critics bad-mouthing my even-numbered symphonies," he continually groused. "Can't they tell they're all good, each in their own way?" Even if you considered his posthumous career, now over 180 years and thirty symphonies later, Beethoven still managed to come up with different responses each time he came face-to-face with what he called "the Symphonic Question." He'd gone much farther than Haydn – even a thousand symphonies later – had ever done. Mahler himself would be much affected by this one. And how he hated sitting there in Stravinsky's Tavern having to deal with Mahler and those endless discussions about "What is a Symphony?" It was enough to make him miss the old days of the conversation books! What started out like a slow introduction, despite the tempo indication of Allegro non troppo (not too fast), gradually unfolded as the first theme, the violins playing the notes of a triad – slowly undulating arpeggios – which the solo horn then picked up and, playing them in faster rhythms, turned into a gradually unwinding melody supported by flutes and clarinets. This melody, more than just a triad, served as its own harmony. What sounded like a chord progression turned into sequences of this melodic-harmonic cell flowing so seamlessly, you could overlook how simple it really was. But that was Basic Beethoven. A common device from his mortal symphonies, he expanded it to greater and more complex lengths in his 13th, 27th and 35th symphonies, yet never losing that sense of sublime simplicity. His famous small cells, the building blocks opening his 5th or 21st symphonies, became larger, like durable structural beams spun out of diamonds. And it wasn't only his own works where you sensed this. Without Beethoven's examples, the symphonies of Brahms and Bruckner, Mahler, Shostakovich or Sibelius would all have been very different works, each finding significant influences there. Even those "anti-symphonies" by Berlioz and Liszt found inspiration in Beethoven's "Pastoral," at least metaphorically, implying some dramatic story told across its surface. But Beethoven argued these were only "surface elements." You needed to dig down to find the structural architecture that supported the surface: in lesser composers, symphonies like that usually fell flat because it lacked this support. It didn't matter whether listeners could "hear" this or not – and by that he meant "hear it and consciously point it out," talking technically the way a composer might talk about it – that wasn't the point. It was something subconsciously understood, a realization satisfying the listener without necessarily knowing why; unsatisfying, much the same way, when it was lacking. Studying the latest music written over the past century, Beethoven had become disturbed by the sound of some trends composers were following but he understood them as direct reactions – pro or con – to his own ideas. If Schoenberg ordered pitches in the technical way serialism implied, he was doing so because he understood the organic importance of inner structure. 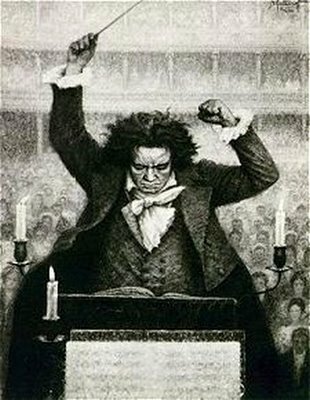 Though he wasn't pleased initially with Alex Ross's statement, "Beethoven got it wrong," in his otherwise wonderful book, The Rest Is Noise, he understood it was all a reaction to him, impossible if he'd never been. First, the orchestra "ran" each movement through non-stop to get a sense of it before going back to fix some technical details. Basically, for a first rehearsal, everything was progressing smoothly, nothing requiring them to stop. They might need to clear something up that hadn't come across quite so clearly, but on the whole he was feeling pretty confident. Used to having the composers sitting in on later sessions of the rehearsal process, Maestro [Name] was even more nervous than usual. Beethoven was quite well known as a notorious stickler, not one he'd risk disappointing. If his musicians weren't "on the needles and pins of extreme anxiety," as he put it, he himself was feeling close to nausea, ready to break out in a sweat at the least chance of complication. While it was deemed an honor to premiere a major new work by Beethoven, many conductors often wondered, "was it worth the aggravation?" The one trumpet player missed his cue and came in a beat late but managed to catch himself, making the necessary correction so that he, the conductor and Beethoven were probably the only ones who noticed. Otherwise, the first movement's read-through had gone splendidly, only a few other things needing touched up here and there, but otherwise quite impressive. There was that spot leading up to the scherzo's trio they'd have to go back and work on – something in the cross-rhythms between winds and strings before the trombones entered – but the second movement went surprisingly well. Throughout the rehearsal, [Maestro] expected to be interrupted by the composer at any moment, but there was nothing – not even a cough. Was it possible that Beethoven had already left? Hadn't he liked it at all? Then from the darkness of the auditorium, there was enthusiastic applause from their lone audience. Beethoven, usually quite reserved, was shouting, "Bravo! Superb!" "So with that, everyone – good job! Let's take a break," he smiled, "ten minutes. No, we're ahead of schedule – make it twenty." Stepping down from the podium, [Maestro] looked like a much younger man than before. Very few rehearsals in recent memory had gone this well. [Maestro] was often reticent with his praise so between that and hearing Beethoven yelling "Bravo" from the hall was enough to put smiles on everybody's faces. Marsha Funebre, the personnel manager, was clapping everybody on the back, wishing she had champagne to pass around backstage instead of plain soda. From there, the plot continues. Two members of the orchestra are secret agents working for the Security Division of BHUIA, the Bureau of Harmonian Universal Intelligence Agency (formed from two previous but redundant organizations, the Bureau of Harmonian Intelligence and the Universal Intelligence Agency). Agents Rondo Sharrif, the principal horn player (a young Palestinian musician who had been killed in an attack by a suicide bomber on his way to a rehearsal with the West-East Divan Orchestra), and violist Roger Babbitt (whose initial appearance, running late for the rehearsal, is very much like the White Rabbit in Alice in Wonderland) are summoned to appear as witnesses in the trial where Judge Willa Fortune will preside over the case against Dr. Cranleigh and his associates, Trespassers wrongly charged with the plot to kill the Great Composers (who, of course, wonder what’s the point, since they’re already dead) while Klangfarben runs free to next attack Mozart. Incidentally, like many names in The Doomsday Symphony, Rondo Sharrif, such a fine player his friends call him “Horn Solo,” is an anagram, in this case of Harrison Ford (who, of course, was Han Solo in the original Star Wars). But there is more to this excerpt than meets the eye – just as there is usually more to the music than meets the ear – but I’ll get into that in another post. Update: In the spring of 2011, I completed the novel, The Doomsday Symphony, and posted it on the installment plan (making it a serial novel) which you can read, beginning with this introductory post. If you've already read this post, you can just click on ahead to the first installment. Elliott Carter turns 102 years old, today. His plan had been to attend a celebratory all-Carter concert in Toronto that featured works all composed in 2008-2009 including a world premiere. According to this article in the Toronto Star, the New Music Concerts ensemble, led by flutist and long-time Carter advocate and collaborator Robert Aitken, Carter was unable to attend the performance but for what reasons, I'm not sure. This past June, Carter attended the world premiere of his recent song cycle, setting poems of Marianne Moore, "What Are Years?" at the Aldeburgh Festival. The world premiere in Toronto last night was the Concertino for Bass Clarinet and ensemble, written late last year for his long-time assistant, Virgil Blackwell. Here is an interview recorded with Carter a month ago – Blackwell is also present for some of it. The production uses a lot of un-Carteresque ambient sound as well as clips of works by other composers who've influenced him as well as tantalizing snippets of his own works plus a kind of time-line where you might hear a bit of a piece Carter wrote in a certain year followed by something from Beckett's "Waiting for Godot" written that same year, or a historical speech or announcement about some major news event. In all, it's a very good introduction for people who are not familiar with his style, may not in fact like his style but could understand his approach to his music – how he writes it but more importantly how he thinks about it as he's writing it. Despite its legendary complexity, his music does not start out to be "complicated." As I've tried to explain to people who are put off by the fact you can't tap your toe to it, the "complexity" is a way of approximating what he's hearing – how the instruments, for instance, are expressing their personalities (he often talks about how the players are characters who have ideas and reactions, who may discuss things and who may change their ideas and opinions over time), how these elements overlap in time and how their rhythms interact with each other sometimes by seeming not to interact, the way we normally think of it, but often exist on separate planes simultaneously. And if you think about it, despite his well-known way of expressing himself which often sounds much like his music – playful, often tangential, sometimes stuttering to find the right word or idea – he doesn't sound bad for a man a month shy of turning 102! That fact alone is enough for people to take notice of him – "wow, the man's 102 years old, imagine that!" – but the fact he's also busy composing and looking forward to the next piece is also amazing. Since his late-80s, he has become even more prolific than he had been when he was considered on the tail-end of his career after 70. His earliest music reflected a lot of what was going on around him in New Music before World War II. The "Holiday Overture" and the two ballets "Pocahontas" and (for me, especially) "The Minotaur" as well as his "Symphony No. 1" would all be typical of the American Scene between the wars – sounding like a mix of Copland and Ives, perhaps – but there are lots of fingerprints of the more mature composer already in these works. After the war, with the Piano Sonata – to me, a work that would fit into any recital program as well as Liszt's monumental sonata – things started taking on a different turn. The Cello Sonata plays off this "time-counterpoint" where the cello is flexible but the piano more rigid and often moving at a different "pace" than the sound of the cello. Also, in one sense, the cello is "romantic," emotional and varied, while the piano is more "classical," stricter sounding and structural, the bones of the piece whereas the cello is the skin, the heart, the soul of the piece. It wasn't until the First String Quartet that Carter reached his "true voice." This work, composed famously in the isolation of the Arizona desert where the sense of time – an all-important facet of his style – is very different from living in New York City. Not only is it his most expansive work, the quartet flows with an organic quality that is like life itself. By this time, he was in his early-40s, considered a "late-bloomer" compared to other composers who'd found their voice at a much younger age. The music he wrote in the '60s and '70s – like the Concerto for Orchestra or the Third Quartet (which is really two duos playing two often different but simultaneous pieces, each duo even playing a different number of movements) – is his most complex and was viewed at the time as "Late Carter." The man, after all was in his mid-60s. Most commentators, looking for a pigeon-hole description, referred to these pieces as his "Late Period," as Beethoven's "Late Quartets" are Beethoven at his most complex. So the general attitude was, Carter, now 70, would do what most composers do when they reach retirement age – write less, rest on his laurels, and perhaps focus more on teaching or being an Elder Statesman in the New Music World. But not so with Carter. Since the 1980s, when he was 75, he began a whole new wave of creativity, probably the most prolific period of his life. While many of these may be "miniatures" and solo pieces, there are several concertos, a few large-scale orchestral works, two more string quartets, songs and song-cycles, and, most surprisingly, his first opera, "What's Next?" which he composed for performances during his 90th Birthday celebrations! Carter's biographical entry at Wikipedia has a partial list of works, of which over 75 were written after he turned 75. 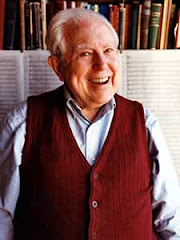 Elliott Carter has long been a favorite composer of mine and his birthday is something I celebrate the way other music-lovers might observe Beethoven's or Mozart's birthdays. Today and over the next few days, I will be listening to several recordings – some of them, with scores – starting with another of my favorite works, his "Variations for Orchestra" – the full score I ordered last week through Barnes & Noble On-Line arrived in the mail just an hour ago, just in time to help me celebrate the composer's 102nd Birthday. In the next few days, I will try to post some video-clips (the wonder of YouTube) of some of his works, including an exciting performance of his Cello Concerto (written in 2001) by Dane Johansen, a Juilliard student who chose it for his Concerto Competition Diploma, recorded at a dress-rehearsal with the Juilliard Orchestra conducted by a long-time Carter champion, James Levine. Or this performance by Pierre-Laurent Aimard of a brief solo piano piece, "Catenaires" which Carter composed as one of many works to be premiered during the world-wide celebration of his 100th Birthday. The vitality of this music is stunning regardless of its complexity – and then when you consider Carter was 92 when he composed the Cello Concerto and almost 100 when he wrote "Catenaires," it is even more stunning. 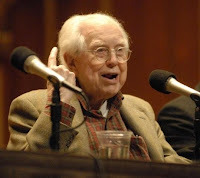 Photo credit: The header photo of Elliott Carter, which I found unattributed on a few different internet posts, was probably taken during a pre-concert interview, I suspect from the DVD accompanying Naxos' 100th Birthday Celebration disc featuring Robert Aitken and members of the Toronto-based New Music Concerts Ensemble. The Grammy Award nominees were revealed tonight – music's answer to the Oscars and the Tony Awards – during a concert telecast on CBS. Not that I have anything against LL Cool J (he's great on NCIS: Los Angeles) but there isn't enough Benadryl in the house for me to sit through even two minutes of Justin Bieber, so I'm just scouring the web-site waiting for the list of nominees to be posted because, like, I rather doubt Hilary Hahn's going to be playing the 3rd Movement of Jennifer Higdon's Violin Concerto on the TV show (wouldn't that be great!). Anyway, the winners will be announced on February 13th, 2011, at 8pm – about 73 days from now, if you're counting down. Here are the nominees in the Classical Division: congratulations to everyone whose recording was nominated! 97. Best Classical Album – Award to the Artist(s) and to the Album Producer(s) if other than the Artist. 98. Best Orchestral Performance – Award to the Conductor and to the Orchestra. 99. Best Opera Recording – Award to the Conductor, Album Producer(s) and Principal Soloists. 100. Best Choral Performance – Award to the Choral Conductor, and to the Orchestra Conductor if an Orchestra is on the recording, and to the Choral Director or Chorus Master if applicable. 101. Best Instrumental Soloist(s) Performance (with Orchestra) – Award to the Instrumental Soloist(s) and to the Conductor. 102. Best Instrumental Soloist Performance (without Orchestra) – Award to the Instrumental Soloist. 103. Best Chamber Music Performance – Award to the Artists. 105. Best Classical Vocal Performance – Award to the Vocal Soloist(s). 106. Best Classical Contemporary Composition – A Composer's Award. (For a contemporary classical composition composed within the last 25 years, and released for the first time during the Eligibility Year.) Award to the librettist, if applicable. 107. Best Classical Crossover Album -- Award to the Artist(s) and/or to the Conductor. Anyway, there they are -- tune in Feb 13th, 2011, to find out who the Grammy Winners are!